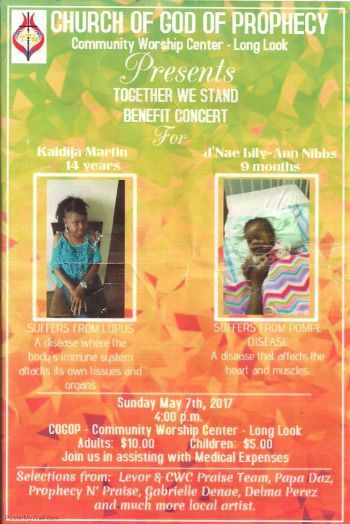 The beneficiaries of the concert at the church in Long Look from 4:00 PM on May 7, 2017 are 14 year old Kaidija Martin, who suffers from Lupus and 9 month old J’Nae Lily-Ann Nibbs, who is afflicted with Pompe Disease. 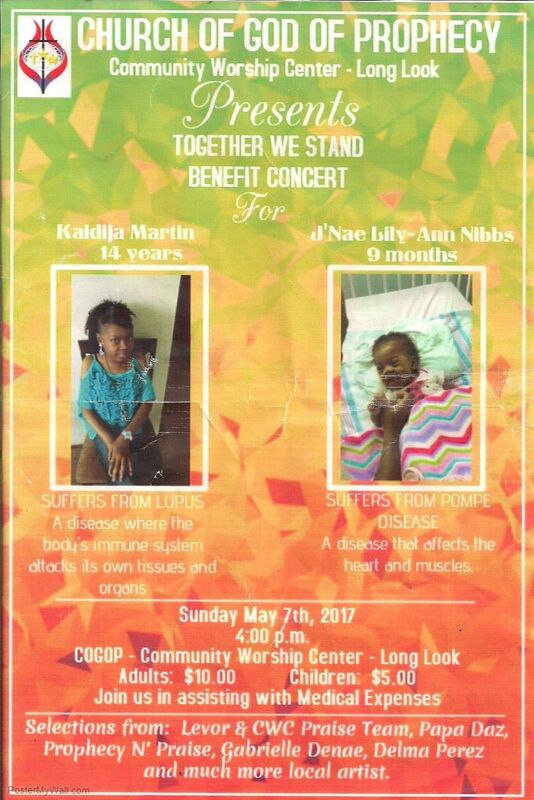 The benefit concert will see selections from Levor & CWC Praise Team, Papa Daz, Prophecy N’ Praise, Gabrielle Denae, Delma Perez and others. “We are hoping to raise as much as we can for each child,” said Secretary of the Women’s League at the Church of God of Prophecy Community Worship Centre- Long Look, Cheryl Small. Small added that there will also be donation sheets and a food sale at the benefit concert to help raise funds. The entry fee to the concert is $10.00 for adults and $5.00 for children. The money raised will go towards medical expenses for both children. According to the Mayo Clinic, Lupus is a chronic inflammatory disease that occurs when your body's immune system attacks your own tissues and organs. Inflammation caused by lupus can affect many different body systems — including your joints, skin, kidneys, blood cells, brain, heart and lungs. While there's no cure for lupus, treatments can help control symptoms. 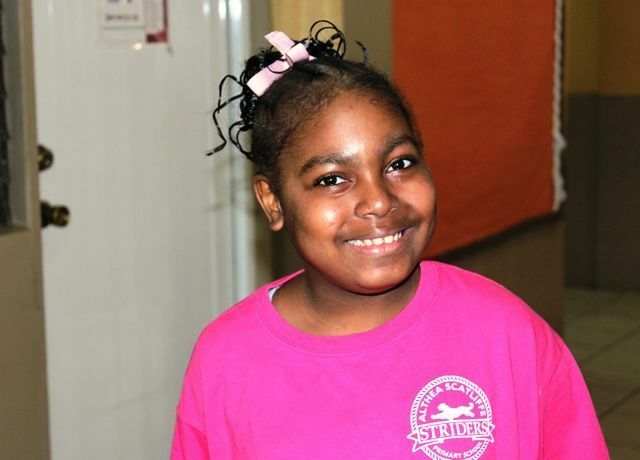 Pompe disease is an inherited disorder caused by the buildup of a complex sugar called glycogen in the body's cells. The accumulation of glycogen in certain organs and tissues, especially muscles, impairs their ability to function normally. Researchers have described three types of Pompe disease, which differ in severity and the age at which they appear. These types are known as classic infantile-onset, non-classic infantile-onset, and late-onset. The classic form of infantile-onset Pompe disease begins within a few months of birth. Infants with this disorder typically experience muscle weakness (myopathy), poor muscle tone (hypotonia), an enlarged liver (hepatomegaly), and heart defects. Affected infants may also fail to gain weight and grow at the expected rate (failure to thrive) and have breathing problems. If untreated, this form of Pompe disease leads to death from heart failure in the first year of life. Can you please provide contact details to donate if a person is unable to attend the concert. You may call L. Chalwell at 442-1523, 499-1523 or Cheryl at 543-5952 to arrange pick up. For persons who would like to donate please see link below. It will be greatly appreciated whether big or small. Thank you very much. Contributions may be mailed to Community Worship Centre, Church of God of Prophecy, P.O. Box 976, Road Town, Tortola VG1110 Indicate the purpose "Benefit Fund" in the memo section of the cheque. Thank you. why we have to fork up the money? 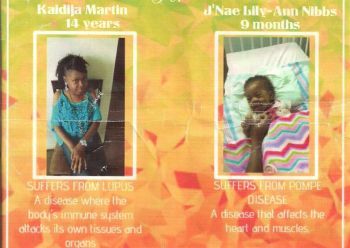 why cant the government give a donation to the parents of these precious child to help cover their medical expenses. after all they re wheel barrowing millions for their personal gratification. This is heart braking. I wish I could adopt one of these children so my insurance could help. I know how much the medical bills can cost. As I am a cancer survivor and saw the bills, but did not have to pay much. But since I can't I will donate on the face book page. These two children are in my Prayers.